The .20 Practical is a few years old. Do a search on Saubier and you will see alot of information on it. Not to steal anybody’s thunder, but the “20 Practical” origins should have included a reference toward Warren B. EDITOR: Point made. I’ve included the reference. See response to comment below. Warren provides a plethora of information ranging from name concept, case prep, die modifications, project components, gunsmith, reamer manufacturer, and even detailed load data. 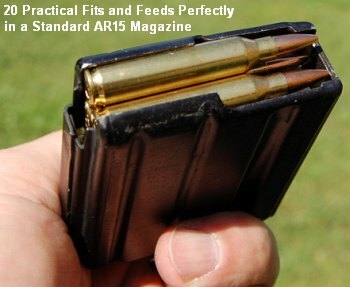 Warren’s GOW article also has a picture of loaded rounds in an AR-15 magazine suggesting that they feed perfectly. In my opinion, your “20 Practical AR” article is essentially a 4 paragraph synopsis of Warren’s already completed work on YOUR website. I respect your opinions and published daily bulletin, however please remember the golden rule of Journalism 101, mention the source & give credit where it’s due. EDITOR: Robert merely provided the test information, photos, and video. I wrote the article. The description of the project gun as “new” was my call because some features of the upper are in fact unique, the 20 Practical PT&G reamer specs have been modified to improve feeding in a semi-auto, and we are working on special new furniture for the gun which has never been offered on an AR before. Again, we aren’t claiming this is a new chambering. We ARE saying this is a new Rifle system. We are not aware of anybody else who has produced complete, production 20-223 uppers for the AR15 (though there certainly may be a few 20-223 customs out there). If there was an error in not mentioning Warren, it is mine. 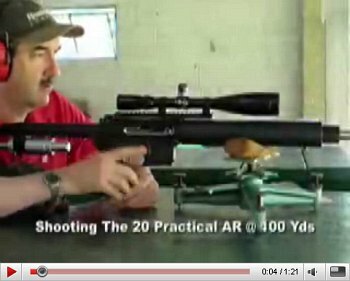 There is definitely no intent on our part to gloss over Warren’s contribution to the 20-223 “Practical” concept. And as even Warren will tell you, a 20-223 is not new–this was first wildcatted a long time ago. So, number one, yes we need to give Warren credit for doing a lot of the initial work on the chambering. But two, this gun, as a SYSTEM, as opposed to just a chambering, IS something new. I suspect you did not do a build up or testing of the 20 Practical in an AR-15 with all the information Warren supplied in the “guns of the week” article or you might not have made the comment you just made. I am not going to get into a fuss over the write up or the comments but after doing hundreds of AR-15 build ups with wildcat AR-15’s and AR-10’s, I know one thing for sure, an AR-15 is a whole different rifle than a bolt gun and what works well in a bolt gun may not work well at all in an AR-15. The reamer design we recommend for general use in a 20 Practical in an AR (the “20 Practical AR”) is different than Warren’s (“20 Practical”) because Warren’s was designed for a bolt gun, not a semi auto AR-15. Warren’s design works well in an AR-15 with a small base sizing die, but if you want to use your existing standard Redding Type S FL sizing die, you should use the chamber design we recommend. 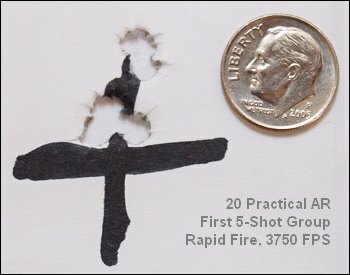 Many times bolt gun loads do not shoot well or function well in an AR-15 for a variety of reasons (powder pressure curve wrong for AR-15 accuracy or function, or out of balance with the AR-15 semi auto platform). While there are a lot of bolt gun loads posted, there are none posted for an AR-15. In an AR-15 where the case comes out of the chamber under pressure and there is blow back, a load that works in a bolt gun may prove to be both dirty and inaccurate in an AR-15. Without testing you would never know this. What Warren did is great and we’re trying to expand on it and add to it, not detract from it. This past winter my shooting partner and I had John Holliger of White Oak Precision build two AR uppers in .20 Practical. John knows ARs and did a wonderful job for us. Using a 32 gr. Hornady v-max and VV-n133 we are seeing 3750-3800 FPS, with accuracy in the threes and fours! of low recoil, spotting our shots was easy! This is an simple cartridge to load. We used once fired Lake City cases in a Dillon 550B. Case prep was staight forward as Warren suggested in his previously posted article. Try it you will like it! Just had a 20 practical built and I need some good loads. NEED HELP!